When you create a new campaign, one of the first things you’ll need to decide is the schedule. Do you want it to run continuously? Or do you want to run for only during select dates or times? What about adjusting CPCs for days or hours? Read on for all of the scheduling options you can do to best suit your campaign strategy. By default the campaign will be set to run continuously and will start running at 12 AM Eastern Standard Time (UTC-05:00). When the campaign is set to run continuously, it won’t stop running unless the budget is capped for the day or unless you manually pause it. If you want to add specific start and end dates for the campaign, use the Set Dates option which will allow you to do this. In addition to setting the dates your campaign will run, you can also change the start time of your campaign. To set your campaign to start at the same time each day, select the Daily option. Please note that all times are set to Eastern Standard Time (UTC -5:00) only. Also, when using this option, the end time cannot be adjusted. The campaigns will always run until midnight EST during the scheduled period. But what if you want your campaign to run on a more specific schedule? What if for example you only want it to run during business hours or only on the weekends? What if you want to adjust your CPCs for certain hours or days? For more advanced scheduling,you’ll want to select the Set Schedule option. 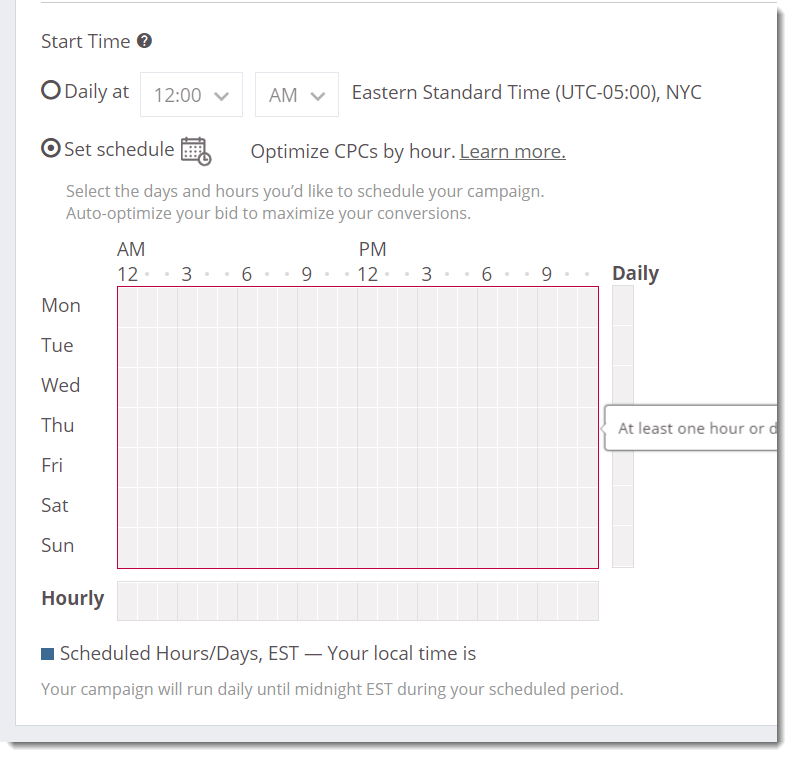 This option will allow you to set what exact days and times your campaign will run. Each block is one hour. If the block is filled in, it means the campaign will be running during that block of time. By default, all the blocks will be empty so you’ll need to select what times and days your campaign will be scheduled to run. Please note that if using this option, you will be unable to save your campaign unless one hour is selected. 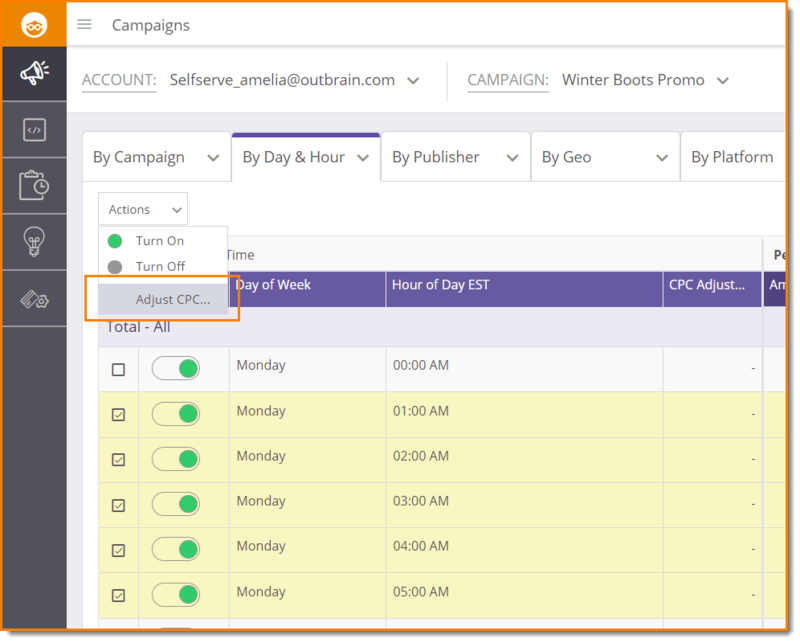 To adjust the schedule for your campaign, simply left click on the box for the desired day and time to select it. You can also hold your mouse button to select multiple boxes at once. To clear a box, simply click on it again. For example, the schedule above shows what it would look like if the campaign was scheduled to run from 9am to 6pm, Monday through Friday. Please note that only the desired hours have their blocks filled in! What if you are wanting to run campaigns for audiences in a completely different time zone? While the schedule is set to Eastern Standard Time (UTC -5:00), because you can fill in whatever hours you’d like, you can setup your campaign’s schedule to accommodate different time zones. 1.) First determine what schedule you want your campaign to run using your targeted location’s time zone. 2.) Convert the start time and end time to Eastern Standard Time (UTC-05:00). 3.) Add the those converted times to the Run Schedule. 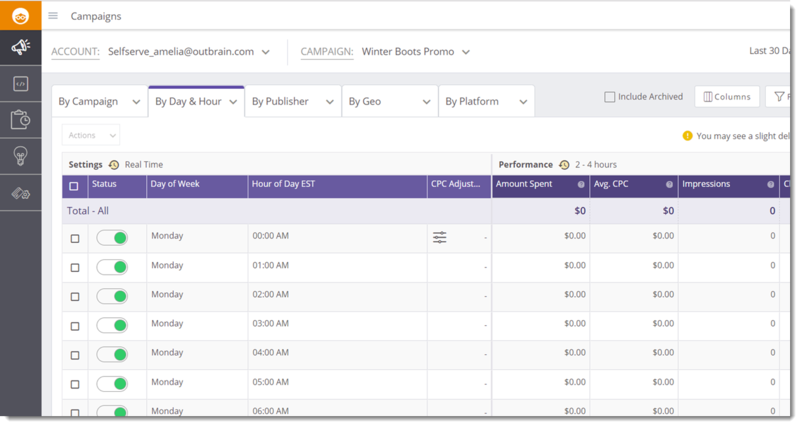 By using the Set run schedule option, you can ensure that your campaigns run exactly when you want them to. You can also adjust the CPCs by days and hours. To do this, first select your campaign from the Campaign drop down menu at the top of page. Next, select the ‘By Day & Hour’ option under the By Time drop down menu. This screen will show you all the days and hours of the week (as well as the breakdown of campaign performance by day and hour). 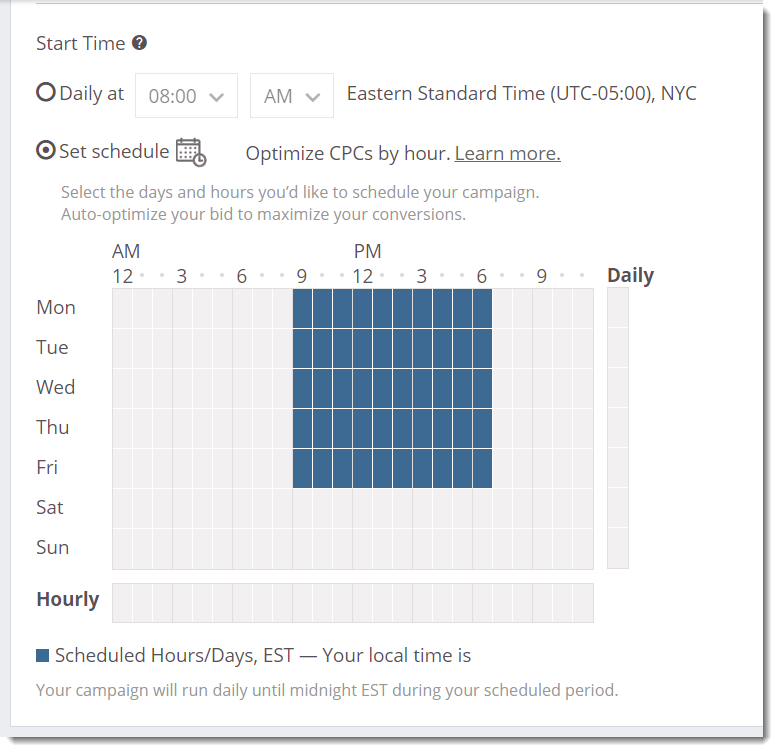 Like with CPC Adjustment by section, to adjust the CPC for a selected hour of day, in the CPC adjustment column, set a specific CPC, choosing a percentage higher or lower than the fixed campaign CPC. To modify multiple CPC adjustments at once, select all the sections you want to optimize by checking the box on the left. Next, click the Actions drop down in the upper left and select Adjust CPC. Campaigns using daily budgets will have their budgets reset each EST calendar day, regardless of their run schedule. This also means that if the campaign is scheduled to only run for a few hours on a selected day, our system will try to run the full day’s budget in that time. At this time the default timezone for the Dashboard is Eastern Standard Time (UTC -5:00). This cannot be changed at this time. Have questions? Reach out to our friendly Support team!